Mats and his family were vacationing at a lake in Sweden [locate Sweden on map]. Mats was eager to try out the windsurfer his parents had brought with them. A windsurfer is a surfboard with a sail mounted on it. Mats took the windsurfer into the shallow water near the lake’s edge to practice, and his confidence grew every day. “Watch out for me, Dad,” Mats called. His father turned and waved, and Mats pushed the windsurfer into the water. Mats paddled out a ways, then stood up and grabbed the rod that stretches across the sail. He moved the sail to catch the wind and was soon moving smoothly across the water. The wind picked up speed as Mats sailed out onto the lake. About 20 minutes later he realized that he was too far out. He tried to turn the windsurfer around, but the wind kept pushing him farther out onto the lake. Mats’ arms were getting tired, and he wondered how he would get back to shore. He decided to swim to shore and pull the windsurfer behind him, but he soon realized that this would not work. He climbed back onto the board, shivering from the cold, and lay down on the board. He tried to paddle toward shore, but after several minutes his arms were too tired. “Lord, I’m in trouble,” Mats prayed. “No one but Dad knows where I am. Please help him find me.” Then he waited. Suddenly, Mats heard a motor. He scrambled to his feet and saw a motorboat in the distance. He waved, but no one saw him. The boat kept going. Mats stood on the windsurfer watching the boat disappear. Then slowly, carefully, he lay down on the board again, cold and shivering. As darkness fell, Mats wrapped himself in the sail like a blanket and lay down on the narrow windsurf board. The sky grew dark and stars came out. He tried to sleep, but he could not relax. It was so very quiet, with only the sound of the waves lapping against the board. He thought of his family eating their dinner and wished he could be with them. No, they wouldn’t eat without me, Mats thought. Surely they are looking for me. Why don’t they come? Then all of a sudden, Mats heard a noise. It sounded like a helicopter. He lifted his head and looked into the sky. He saw a searchlight swinging back and forth across the water. He struggled to his knees and began waving wildly. At last the light hit Mats, still waving his arms. 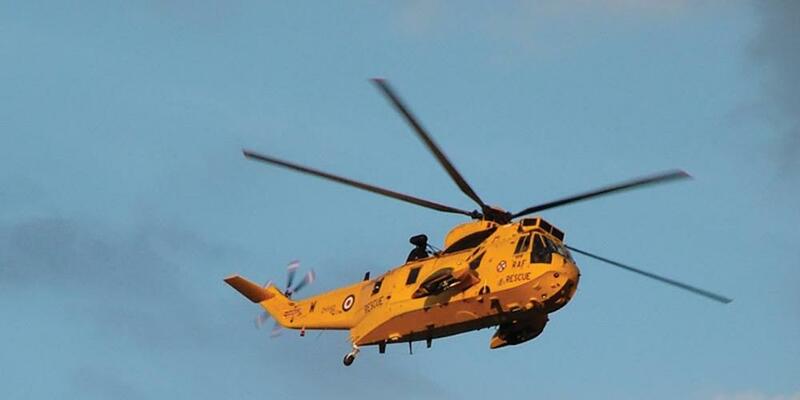 A man slipped out of the door in the belly of the helicopter and dangled from a rope. He came closer, and wrapped a rope around Mats, and the two were pulled back up into the helicopter. Another man wrapped Mats in a blanket and urged him to lie down. It felt so good to be on a solid surface again! The helicopter flew to a hospital, where Mats was checked over and pronounced in good health. The next morning his parents came. “Take me home,” he begged with a weak smile. Later Mats learned that when his father couldn’t see him on the lake, he became worried and started searching for him. But when it began to get dark and the family hadn’t found him, they called in the helicopter to search. “I’m glad that my family loved me enough to search for me. I’m glad that God knew where I was and kept me safe,” says Mats.